A much-changed Barcelona played like the strangers they are as battling basement boys Huesca dug out a 0-0 draw over La Liga’s champions-in-waiting. There were full debuts for French defender Jean-Clair Todibo and La Masia youth product Riqui Puig in a side that had only retained keeper Marc-Andre ter Stegen from the 1-0 victory over Manchester United in the Champions League last Wednesday. 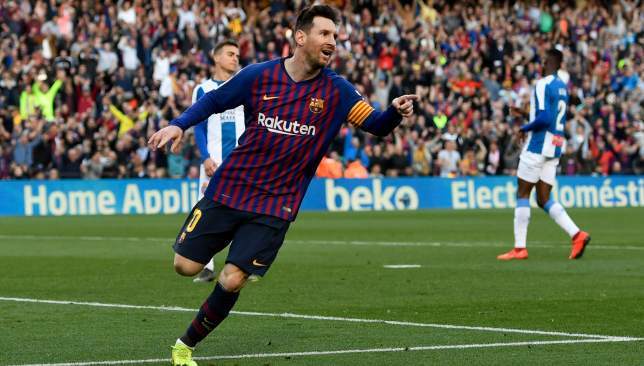 Lionel Messi leads an all-star cast of absentees for runaway La Liga leaders Barcelona when they play relegation-threatened SD Huesca on Saturday (18:15 UAE KO), enabling them to be fresh for Tuesday’s Champions League quarter-final decider against Manchester United. Messi, 31, was left blooded by a collision with Red Devils defender Chris Smalling during the midweek 1-0 win at Old Trafford. The 33-goal forward was not part of the 18-man squad announced late on Friday night. Spain anchorman Sergio Busquets has also been rested, while Croatia midfielder Ivan Rakitic (illness) and right-back Sergi Roberto (injury) are unavailable. Centre-back Gerard Pique and Uruguay striker Luis Suarez are suspended. Attention will switch to Ousmane Dembele. The France winger was an unused substitute in Manchester after he recovered from injury, meaning he may feature for the first time since March 13. 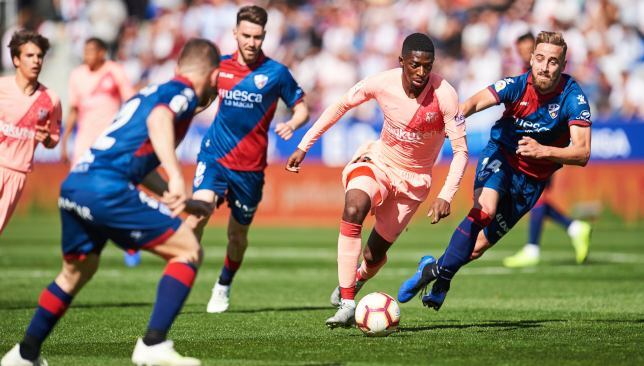 Youngsters Jean-Clair Todibo, Riqui Puig, Abel Ruiz and Moussa Wague could all get minutes at the division’s bottom-placed side. Sassuolo loanee Kevin-Prince Boateng may get the nod for just a second top-flight start at Barca. Huesca were beaten 8-2 when the sides last met in September. The Catalans come into the weekend with an 11-point advantage over second-placed Atletico Madrid. After grinding out a result against Manchester United mid-week in the first leg of their Champions League quarter-final, Barcelona are back in action in La Liga as they take on relegation-threatened Huesca. The defending champions have practically laid their hands on the title and need just 10 points from the remaining seven games to mathematically retain their trophy. Ernesto Valverde will be looking to take another step towards a consecutive league title while keeping in mind that a crucial Champions League clash against United awaits his team on Tuesday. We take a look at the talking points as opposite ends of the league table lock horns at Huesca on Saturday. 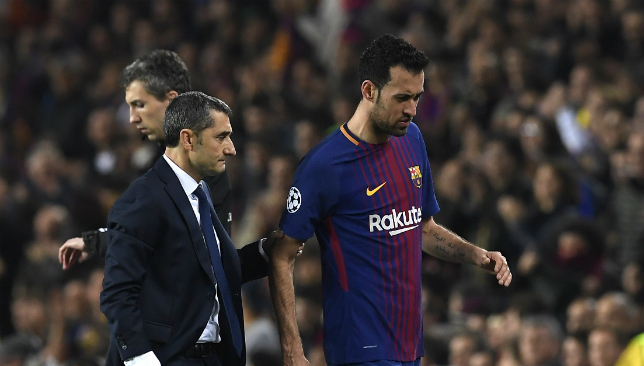 Sergio Busquets is likely to be rested ahead of the second leg against United. With the league in the bag and the fatigue of having played Atletico Madrid and United in a span of four days, Valverde is bound to rotate. But to what extent is he willing to shuffle his starting line-up? It’s very likely that Lionel Messi, Sergio Busquets and Jordi Alba will be rested. Luis Suarez and Gerard Pique will be missing the game due to suspension. Clement Lenglet has been putting in solid shifts without much rest and he too could do with a pair of fresh legs on Tuesday. That leaves Samuel Umtiti with one of Jeison Murillo, Jean-Claire Todibo and Thomas Vermaelan in central defence. While it’s likely that Busquets will be rested, it would be wise to provide the Spaniard with a few minutes to let him feel the game and hit the reset button after a series of underwhelming performances. Ivan Rakitic has been overused – like every manager who has ever managed him – and could do with some rest too. This means that Carles Alena is very likely to get a rare start. Although he is still far from his Liverpool form, Philippe Coutinho has looked sharp in the past few weeks and a couple of goals against Huesca can surely raise his confidence for the second leg of the quarter-final. Clearly, fatigue is not the only factor Valverde needs to consider while resting players. There are some regulars who could do with a few minutes or even a start to get their mojo back. While 11 points separate league leaders Barcelona and second placed Atletico, just 10 points separate bottom-placed Huesca and 14th placed Girona. Villarreal (30), Rayo Vallecano (27) and Huesca (24) are currently in the relegation zone, but Valladolid (30), Celta Vigo (32) and Levante (33) are not entirely safe either. An unlikely win against Barcelona could provide a huge boost for Huesca’s chances of survival. They face fellow basement dwellers Vallecano in the next game and that will surely be a huge fixture for both teams. If Huesca manage to beat a potentially second string Barca, they will be in great spirits to take Vallecano on. But if they fail to take advantage of a heavily rotated side, it could very well be the end of the road for the minnows. Either way, this fixture could be huge in the relegation battle sub-plot of La Liga. Ousmane Dembele could make a long-awaited return to the Barca side. On Saturday, Ousmane Dembele could be taking the pitch for the first time since his cameo against Lyon in the Champions League a month ago. This game will be particularly important for the Frenchman as it could go on to shape his and the team’s fortunes for the rest of the season. 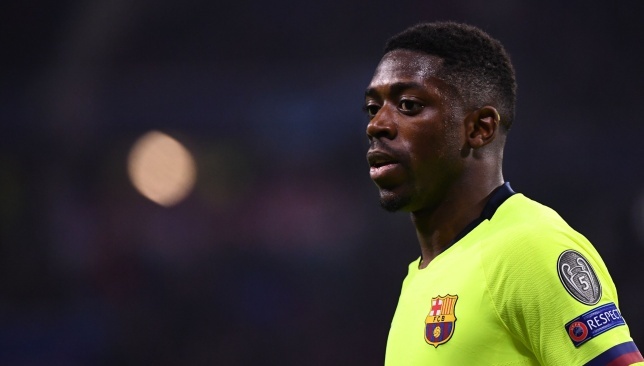 When the Catalan giants were eliminated from the Champions League by Roma last season, they lacked a player of Dembele’s abilities – someone who can change the game with a moment of magic. Against United in the first leg, Barcelona could probably have scored one more goal in the second half if it was Dembele who was chasing the ball in space instead of Sergi Roberto. The 21-year-old could hence play a massive role in Barca’s quest for yet another treble. But first, he needs to achieve match fitness and get back up to speed gainst Huesca. A solid performance – regardless of the opposition – is bound to place the youngster in high spirits ahead of the Champions League game. 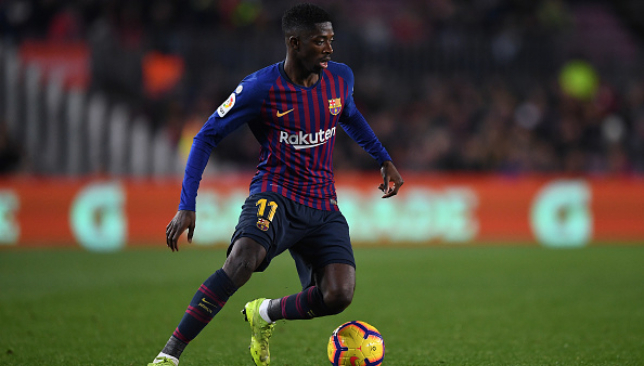 With Messi being crowded in the centre, Dembele could turn out to be Barcelona’s trump card.